It is a common statement that Fort Lauderdale has transitioned from being a sailboat cruising waypoint to a megayacht mecca. I have been crunching the numbers to understand the position of the city more in depth. Last week, I posted my raw research data. A synopsis of what I have found is yes, Fort Lauderdale is an area where most the yacht value is in power yachts compared to other regions of the country. The ratio of power to sail boat listings is 10 to 1 while in Annapolis, the ratio is at parity. In Newport the ratio of power to sail is a more moderate 4 to 1. It is interesting to note that the ratio of actual sales of power vs. sail in Fort Lauderdale is 5 to 1 compared to the 10 to 1 ratio of advertised listings. Can anyone speculate why this might be? The dominance of power also plays out in terms of asking prices. Of the approximate 2 billion dollars of inventory available in Fort Lauderdale, 1.934 billion of that is in power. Only 66 million dollars are in sailboats. And of that 66 million, 28% is made up by MITseaAH who is asking 19 million. Some of my most interesting discoveries came via looking at old sales data. I have quantified two important trends looking back over sales data from the last 8 years from 2003 to 2011: (1) the increase in power sales and (2) the increase in multihull sales. The first trend is an increase in power vs. sailboat sales in Fort Lauderdale. So not only is Fort Lauderdale a primarily power area, that bias is actually increasing. In 2003, powerboat sales accounted for 80% of sold boats. In 2011, power sales have accounted for 85% of all sales. That is about a .5% shift yearly. I see this trend increasing. The future of Lauderdale is in large power yachts such as those featured at the Fort Lauderdale International Boat Show. The second trend is a shift from monohull to multihull sailors. I have been noticing and talking about this trend but am happy to quantify the sales data. 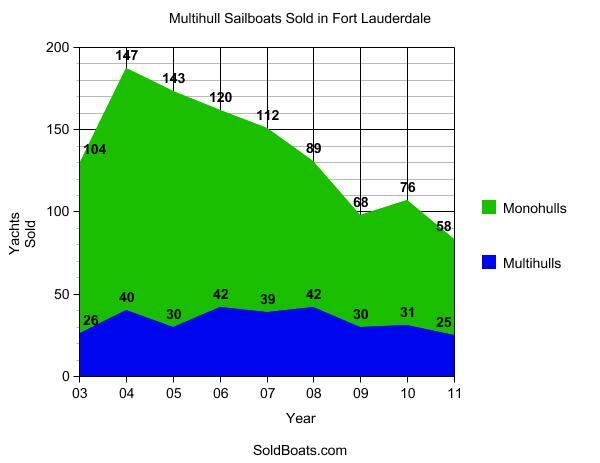 In 2003, 20% of sailboats sold in Fort Lauderdale were multihulls. Since then there has been a upward trend. This year 30% of the sailboats sold in Lauderdale have been multihulls. If you combine these two trends, the increase in power sales from 2003 to 2011 from 80% to 85% and the increase from 20% to 30% of sailboat sales being multihulls, the end result is a shrinking market share for monohull sailboats from 16% to 10% in Lauderdale over the same period. A percentage of sailors who used to buy monohulls are either going to multihulls or power yachts. Looking at Annapolis, the power trend is even more dramatic while there is an uneven track record for multihulls. Over the last 9 years, power sales have increased from 26% to 41% of total sales, a dramatic shift. But multihull sailboats have wavered from 7% in 2003 down to 2% in 2007 then climbing back up to 6% this year, 2011. Monohull sales are still dominating the market in Annapolis. Comparing numbers nationally and globally, most markets resemble Fort Lauderdale in terms of power, and Annapolis in terms of mono versus multihulls. So Fort Lauderdale’s high percentage of power at 85% only slightly exceeds the USA’s rate of 81% and the international number of 74%, but the multihull percentage of 30% is much higher than the 4% national and 5% international rates. As these Fort Lauderdale trends continue to play out, I see a local need for berths to accommodate the increasing inventory of large power yachts and beamy multihulls. What changes do you notice in your sailing area?